This entry was posted in pistol, training, weapon and tagged 9x19, pink, woman. Bookmark the permalink. That muzzle’s really gonna flip. Get that trigger hand, and wrist, higher up onto the gun. 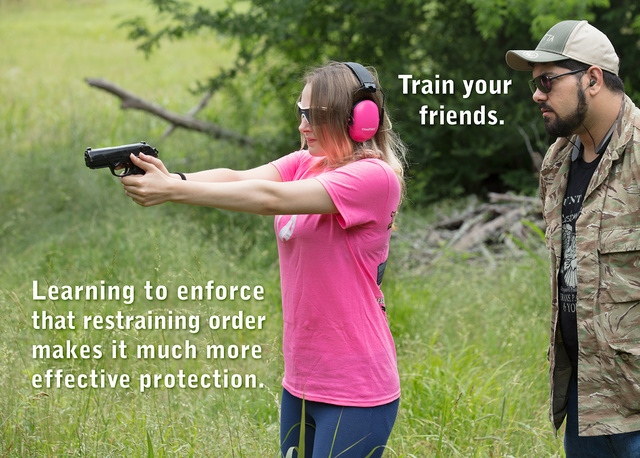 “Teaching your friends to defend themselves makes them safer and more independent.” And less likely to advocate socialist/authoritarian government, or develop an unhealthy dependency on such. And if you do have to ballistically enforce a RO, having the restraining order will make it a lot easier to get through the subsequent legal process.